With more than 5000 reported encounters, California leads the nation in UFO encounters. 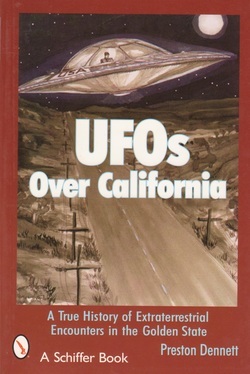 UFOs Over California is the first book to present the complete history of the extraterrestrial presence in the Golden State. Documented here are more than 100 years of encounters, starting with early Native American encounters, the 1896 California Airship Mystery, the 1942 Battle of Los Angeles and the 1947 UFO wave. Hundreds of other cases include sightings and landings at California Air Force Bases, sightings over LAX, celebrity sightings, underwater UFOs, face-to-face encounters, sightings by investigators, implant-removal cases, UFO healings, missing-time abductions, UFO crash/retrievals and more. All the classic California cases are covered: the Cisco Grove robot encounter, the Schidel near-miss with a UFO, the Playa Del Rey landing, the Red Bluff wave, the Bluff Creek encounter, the San Fernando angel hair case and more. The book also contains color photographs of UFOs in flight and illustrations by award winning artist Kesara that will leave every reader searching the skies, seeking the truth! In 1995, veteran newspaper reporter Bob Teets published his excellent book, West Virginia UFOs. This was the first book ever to present a state’s UFO history. Teets, I realized, had uncovered an unfilled niche in the UFO literature. Sooner or later, I knew, the other states would eventually have books written about their UFO history. I have been a California-based UFO investigator for almost seventeen years. After investigating hundreds of UFO cases across the state, and writing four UFO books, I decided that I was finally ready. I am now pleased to announce that UFOS Over California: A True History of Extraterrestrial Encounters in the Golden State has just been released by Schiffer Publishing. California has several unique features that make it stand out from other states. First, it is the most crowded state with an estimated population of 40 million. It is also the nation’s wealthiest state, and is a leader in aerospace and defense, computer technology, oil production, lumber, agriculture, entertainment and tourism. The third largest state, California is actually the leading producer of UFO reports in the United States. In 1977 J. Allen Hynek conducted a study of all the unidentified Blue Book cases. California headed the list with fifty-one cases, or 9.9% of the total number of U.S. reports. More recently, in 2003, the National UFO Reporting Center (NUFORC) listed more than 2800 California UFO reports, nearly twice the number of the second leading state of Washington, and nearly three times the third leading state of Texas. For whatever reason, UFOs find California very attractive. With its rich UFO history, it is not surprising that California has had a strong influence in the evolution of ufology. After having studied several thousand Golden State encounters, I have come up with a top twenty list of what are in my opinion among California’s most significant and influential UFO events. Some of the cases are well known, others are probably obscure except to UFO researchers. Each one, however, represents I think an important chapter in not only California’s UFO history, but in that of the world. Each has added to our knowledge or understanding of UFOs, has changed the way we view UFOs or has contributed to the popularization of the subject. Here are California’s top twenty UFO cases. Each of the cases has been summarized because of space considerations. On Labor Day weekend in 1965, three hunters in Cisco Grove had a unique encounter with a UFO and its occupants. It may be the earliest authenticated California case involving a robotic UFO occupant. The main witness, Donald Smythe, became separated from his two companions while hunting, and after a long day of hunting, he became lost. When he saw a light darting back and forth above him, he assumed a helicopter had been sent to rescue him. Instead, the object swooped down and hovered silently overhead. Smythe realized it was a UFO and took refuge in a nearby tree. At this point, three figures exited the craft. Two figures were five feet tall and dressed in silvery-gray material. The third figure appeared to be robotic. Then followed an all-night-long ordeal in which the UFO occupants remained at the bottom of the tree, sending up clouds of noxious fumes. Smythe lost consciousness several times and in the morning, the figures and craft were gone. Smythe’s story was not without corroboration. Upon re-uniting with his friends, one of the hunters revealed that he also saw a “bright, large light” swoop down at low altitude and dart across the sky. All three also remarked upon the coincidence that the government was already in the area looking for an alleged “meteorite.” Finally, Smythe’s wife saw him immediately after the incident and confirmed that Smythe was badly traumatized and covered with scratches. As they watched, the mysterious object quickly accelerated and disappeared in the distance. Reagan later confirmed the details to Wall Street Journal reporter Norman Miller. Some of the many odd patterns of UFO behavior are typified in the following extensive encounter which began in early April 1953. The two main witnesses, John Black and John Van Allen, were working at their titanium mine outside of Bluff Creek when they both separately observed a “metallic saucer” hovering over the area of the mine. Over the next few weeks, the object returned on four occasions. Then, on April 20, Black observed the craft from a distance of only a quarter mile. It was now obvious to the men that the UFO was very interested in their mine. Exactly one month later, on May 20, Black returned to the mine and saw the now familiar saucer hovering only a few hundred feet high. It quickly took off and disappeared. Black approached the area where it had hovered and found several small five-inch footprints. Then exactly one month later again, on June 20, Black was outside the mine when he saw what he thought was a small child with a bucket. Upon approach, however, he saw the large saucer landed on a nearby sandbar. He examined the figure and realized it wasn’t a child, but instead appeared to be an unusual-looking small man wearing unusual clothes and carrying a cone-shaped bucket. The small man heard Black approach and quickly ran into the saucer, which promptly took off. And so began one of the strangest chapters in UFO history. Black alerted the local sheriff, and the story was somehow leaked to the press. Because the saucer had appeared on schedule three months in a row, everyone was predicting a July 20th landing. More than 200 people arrived on the scene including local residents, newspaper reporters, cameramen and saucer enthusiasts. Snack bars and chairs were set up as if the event were a circus performance. Unfortunately, the UFO never showed up and the Brush Creek ordeal came to a sudden end. The case was investigated by several major researchers, including Gray Barker and Paul Spade, both of whom were actually jailed by the Brush Creek Sheriff’s station when they tried to conduct a stakeout for the saucer. Today the case is considered a classic in UFO history. To avoid Captain Schidel was forced to maneuver the jet into a sudden steep climbing turn. The emergency turn caused havoc in the passenger cabin. One passenger was thrown from his seat and broke his left leg. A stewardess lost her balance and fractured her ankle. According to researcher Donald Keyhoe, “Air force intelligence moved quickly to keep the story quiet.” Nevertheless the press found out and the case became a media sensation. The captains’ sterling reputation, the fact that people were injured as a result of the encounter, and that the fact that the mysterious aircraft was not in touch with any airport control towers all combined to give the case a high level of credibility. Today the case is considered a classic in the annals of airplane-UFO encounters. There are an estimated thousand or more recorded UFO abductions coming from California. Office manager, Melinda Leslie is like most abductees. She experienced early childhood visitations and has been abducted regularly throughout her life. However, at first she was unaware that she was an abductee. She became suddenly interested in UFOs in 1987 after visiting Area 51. Then examining her past, she slowly realized that she had been having experiences her whole life. A missing time encounter in 1989 erased any denials that she was an abductee. Since then, she has experienced the entire range of UFO phenomenon, including medical examinations, emotional testing, baby presentations, warnings of future disasters, and harassment from what appears to be the U.S. Military. In July 1991, Leslie and two friends experienced an abduction while driving along the remote Angeles Crest Highway outside Los Angeles. All three witnesses had full or partial recall of the onboard segment and were able to corroborate each other’s accounts, making it one of the few multiple witness abductions on record. She has also had many other conscious encounters, and has explored many of her memories with hypnotic regression. While Leslie’s case is among the most extensive and complicated of all recorded California abductees, it is otherwise pretty typical. Melinda Leslie, however, is different most other abductees in one particular way: she has gone public with her experiences. In fact, she is one of California’s best known abductees and has remained a permanent fixture on the lecture and media circuit, talking about her experiences, publicizing the abduction phenomenon and contributing greatly to the public education of the subject. Her willingness and ability to interact with all aspects of the public media has helped many people to gain a better understanding of what it means to be a UFO abductee. The Morgana Van Klausen (pseudonym) case is well known among southern California investigators. In most respects, the case is typical. Starting in December 1986, the mother and son began experiencing regular visitations by gray-type ETs in their southern California home. The husband was skeptical at first, until he too received a visitation. In the next two decades, the Van Klausens experienced numerous close-up sightings and missing-time encounters. What makes the case so compelling, however, is the physical evidence. Besides multiple witness testimony and landing trace evidence, on one occasion, Morgana Van Klausen was healed as the result of a UFO encounter. It is this that makes the case unique. As revealed by investigator Bill Hamilton, Van Klausen was diagnosed with a “non-cystic mass” in her left breast. The evening before she was about to have the tumor removed, Van Klausen experienced a visitation. She went to the hospital the next day and was shocked to find that all traces of the tumor had disappeared. Writes Bill Hamilton, “Both the radiologist and the surgeon confirmed that the previous diagnostic had revealed a solid mass and that solid masses just don’t disappear.” Hamilton has obtained the before and after X-rays. This kind of medical evidence is very rare, and makes this case outstanding in terms of proof of UFO reality. In late November and early December of 1996, a UFO appeared over the city of Camarillo for six consecutive days. The first sightings took place on November 28 and 29. Local Ventura MUFON investigators heard about the initial sightings, and knowing that UFOs often appear on consecutive days, they quickly organized an on-site investigation. On December 2, MUFON field investigator Alice Leavy arrived on site with several other investigators. To their amazement, the UFO showed up right on schedule. The researchers clearly observed a “small spherical object” hovering in place. As they observed with binoculars and filmed with video camera and still cameras, the object turned red and ejected a smaller object. The larger object then broke up into several smaller objects which promptly disappeared. Throughout the entire ordeal, the witnesses continued to maintain detailed photographic records. While the video camera didn’t have the resolution to capture the object, the telephoto still photos did. What makes this case unique and important is the fact that several MUFON investigators converged on the scene and not only had sightings themselves, but obtained comprehensive photographic evidence. This may the only case of its kind in California history. The Los Angeles Airport is one of the largest and busiest airports in the entire world, shuttling millions of people across the globe. Unknown to many people, it is also the location of an on-going series of UFO encounters. While UFO-airport encounters are not uncommon in the literature, the LAX sightings are particularly dramatic and consistent. They began in the early 1950s and continue to the present day. The LAX encounters show that UFOs display a strong interest in our aviation technology, can easily evade our fastest aircraft, and sometimes have little fear of being observed. The conclusion is undeniable: California’s largest airport is under extraterrestrial surveillance. This fact alone should give rise to serious concerns in regards to airport security. TWELVE: AN UNDERWATER UFO BASE? While the majority of UFOs are seen either flying in the sky or landed on the ground, a small portion of accounts involve ocean-going UFOs. Sometimes, these craft are seen to actually enter or emerge from the ocean itself. Underwater UFOs are relatively rare, except for one location – a small stretch of coastline off southern California – known as the Santa Catalina Channel. North from Santa Barbara down south to Long Beach, the waters seem to be thick with UFOs. In fact, this section of coastline has produced dozens of cases. The sightings reach back to the 1940s and continue to the present day. The first California underwater UFO was on July 7, 1947 when two San Raphael teen-agers saw a “flat glistening object” emerge from the water, fly around and then dive back into the water 400 yards from shore. Throughout this same year, numerous steamers reported a mysterious “undersea mountain” or a “large mass underwater” which kept appearing and disappearing in various locations in the San Francisco Bay and down the coast. While several theories have been raised to account for this high concentration of reports, the most popular is that there is some type of underwater UFO base off the California coast. In any case, the area is one of California’s most active UFO hotspots. While some UFO researchers would prefer to forget this strange chapter of UFO history, there is no denying its profound influence on the UFO movement. The contactee movement began in southern California in the early 1950s when amateur astronomer George Adamski claimed to have seen, photographed and been taken onboard a flying saucer piloted by friendly human-looking extraterrestrials. His story touched a nerve and electrified the public. Adamski became an instant celebrity, writing books, giving lectures and attracting wide audiences. Before long, many other contactees converged on southern California, all with similar claims. California became the place to be if you were interested in UFOs. Daniel Fry, Orpheo Angelucci, George Van Tassel, Frank Stranges and others all claimed to have made contact with ETs. They also all wrote books and lectured widely. Each of the stories had the same theme – warnings from the extraterrestrials that humans are too war-like, that nuclear weapons are dangerous, that we must not pollute our environment and other philosophical messages – all of which today remains a prominent theme in modern abduction accounts. The ETs were usually described as human-looking, attractive and originating from various planets in our solar system. Often the stories seemed to contain information that is believed by mainstream science to be false (for example: life existing on the moon and other planets in our solar system.) And yet, the cases also have considerable corroborating evidence, including photos or multiple eyewitness testimonies. While the contactee enigma is controversial and has divided investigators, the movement was extremely popular and is responsible for introducing countless people to the subject of UFOs. The annual Giant Rock conference held annually throughout the 1950s and 1960s in the southern California desert still holds the record for the largest gathering of UFO enthusiasts, attracting at one point more than 5000 people. While many people consider the contactee movement to be a product of the 1950s, it continues today. A good example is Los Angeles reporter Philip Krapf, who has written two recent books about his own experiences with friendly ETs. Other witnesses were inside their homes where they observed bright beams of light coming from above, or oval-shaped glowing objects darting back and forth across the sky. One couple was woken up from a sound sleep when an object hovered low over their home and lit up the entire interior. Another couple living high in the canyon observed more than 200 objects over a period of three hours. This particular wave was one of the strongest to ever hit California, and it remained strong for at least two more years, producing more than fifty additional reports of all kinds including sightings, landings, UFO-car chases, UFO-helicopter chases, face-to-face encounters, missing time abductions, onboard experiences, possible animal mutilations, cryptozoological creatures and more. While the main wave was from 1992-1994, the area has a long history of encounters starting from 1942. From that point, the cases increased quickly, with two cases in the 1950s, two in the 1960s, fifteen in the 1970s, fourteen in the 1980s, and at least forty-seven in the 1990s. The June 14, 1992 encounter was listed in Timothy Good’s book Alien Update as one of the best reports for the year. Today the area continues to be one of California’s few major UFO hotspots with sightings as recent as 2004. While the sightings originated in California, they soon spread across the United States. The strange objects became front-page news and caused a media sensation. Interestingly, zeppelins were invented only a few years later. These initial reports, however, remain a mystery. While they have many similarities to modern reports, many investigators are baffled by the dirigible-like appearance of the objects. Some researchers (ie: Jacques Vallee, Jerome Clarke) have pointed to the air-ship wave as evidence that UFOs “track” cultures and have an explanation other than extraterrestrial. Whatever the case, the sightings marked the beginning of California’s involvement with the UFO phenomenon. On August 3, 1965, some of the world’s most famous and best-verified UFO photographs were taken by Los Angeles County Highway Investigator Rex Heflin. At that time, the entire United States was experiencing one an intense countrywide wave of UFO activity. While driving outside of Santa Ana, Heflin observed a silent hat-shaped UFO approaching his truck. He radioed his supervisor but then the radio went dead (a fact later confirmed by his supervisor.) As part of his job, Heflin carried a Polaroid camera. He quickly snapped a series of four photos before the object moved away. While he sought no publicity, reporters from United Press International heard about the photos and persuaded Heflin to turn them over. He agreed and UPI photo experts conducted an extensive analysis, even returning to the site of the incident and attempting to restage the event. They declared the photos genuine and they were published in the Santa Ana Register. The photos electrified the public and Heflin’s case became an instant classic. Not surprisingly, the Air Force declared the case a hoax. Heflin, however, later received a visit from two men claiming to be from Norad. The men demanded the photographs and Heflin turned them over. The story gets more complicated from this point. However, numerous other studies of the photos have since been conducted. NICAP photographic analyst Ralph Rankow and a team of other specialists studied the photos in detail and declared them genuine. Journalist Frank Edwards calls the photos “the best UFO photographs in civilian hands.” Today, the photos are still considered genuine and among the most widely-published of all UFO photographs. Jacobs was ordered to remain silent about what he saw. He dutifully kept silent for seventeen years, before he finally went public with his story. Despite his sterling reputation, he was immediately attacked by arch skeptics/debunkers Phil Klass and James Oberg. He also received numerous death threats, lost his employment, and his mailbox was destroyed with skyrockets following another threat. Investigators, however, located Jacobs’ superior, Major Mansmann, who, on multiple occasions, confirmed the details of Jacobs account. This account is one of several in which UFOs have shown their capability to affect even our most advanced technology. It also shows evidence of the UFO cover-up. This case was originally uncovered and investigated by UFO researcher Yvonne Smith. In mid-March, 1994, the TRIAD UFO conference was held in Coronado, featuring several leaders in UFO research. A few hundred people were in attendance. Seven of the attendees were staying at the nearby Village Inn in three adjacent rooms. As UFO researchers know, it is very unusual to uncover an abduction case involving more than one or two people. However, in the middle of the night of March 15, these seven witnesses simultaneously experienced a visitation by several gray-type ETs who came into their hotel room and abducted at least two of the witnesses. What makes this case unique is not only the large number of independent witnesses, (all of whom have provided extensive interviews) but the medical evidence. All of the witnesses have a lifelong history of UFO encounters, and each of them has experienced a wide variety of physical symptoms including puncture wounds, cuts, bruises, scratches, flu-like symptoms, high-blood pressure attacks, multiple infections, scoop-like scars and more. One of the witnesses has undergone an operation by Dr. Roger Leir DPM, to have an apparent implant removed. The implant was placed in her leg during their Coronado encounter. An analysis of the object has shown it to contain many unusual properties. Dr. Roger Leir has examined Evans and verified his post-abduction symptoms. Says Leir, “I have known Mike for many years now and can personally attest to the physical findings such as bruises and scratches on his skin. While this case has not yet been published, it has accumulated an impressive amount of evidence. Says Dr Leir, “The number of mass abductions are sparse in the literature and this case will be ranked high on the scale of importance.” The case is also the subject of a full-length book by Mike Evans and the author of this article, soon to be released by Galde Press. Among the first abduction cases to be professionally researched and written about are known as the Tujunga Canyon Contacts. The case involved two southern California ladies, Sara Shaw and Jan Whitley, who experienced a missing time episode while staying in their remote cabin in Tujunga Canyon. They later located southern California investigator Ann Druffel, who, along with D. Scott Rogo, Dr Bill McCall and others, conducted an extensive investigation into the case. Today, the many details first revealed in the Tujunga Canyon case and the few others that preceded it have been confirmed numerous times in the hundreds of cases that followed. On August 13, 1960, and for the next five days, California experienced one of the most intense UFO waves ever recorded. The wave was centered over the northern California town of Red Bluff, but actually encompassed Willow Creek, Concord, Corning, Eureka, Pleasant Hill, Healdsburg, Santa Rosa, Roseville, Mineral, Dunsmuir, Honeydew and Redlands. It all began at 10:05 pm on August 13, when Deputy Sheriff Clarence Fry of Red Bluff observed a large glowing object over the Red Bluff prison. Two hours later, two other patrol officers observed a large glowing object hovering 200 feet above their vehicle. The officers alerted neighboring sheriff’s stations and took off chasing the object. Meanwhile, law enforcement officers in numerous other cities also observed the same or different objects. At the same time, hundreds of calls poured in from citizens. Researcher Paris Flammonde calls this wave, “One of the most impressive multiple sightings.” Researcher James Harder Ph.D. was so impressed by the case that on July 29, 1968, he delivered an official paper in support of the case to the Committee on Science and Astronautics, House of Representatives, United States Congress. Incredibly, Air Force Blue Book officials labeled the case as “atmospheric inversion” without any investigation. Still, this case remains one of the most intense waves in California history. In February of 1942, only a few months after the bombing of Pearl Harbor, Los Angeles experienced a visitation by dozens of unknown objects, one large one which hovered over the city for a period of at least six hours. The incident caused an enforced total blackout, and the military was called in to fire upon the strange object. By order of General Marshall, 1430 rounds of ammunition were fired upon the object, which sustained no damage. Numerous searchlights were trained upon the craft, which was also photographed. Six people died of heart attacks, car-accidents or falling debris. The next day, the LA Times printed a now-famous photograph of the object on its front page. While the “planes” were suspected to be Japanese, no evidence of this has ever turned up. Nor do the descriptions given by witnesses corroborate with this theory. To this day, the case remains unsolved. On August 19, 1995, one of the most important event in UFO history took place in a small doctor’s office in Ventura, California. At 5:00 pm on that day, Dr Roger Leir DPM performed three surgeries to remove alleged “alien implants” from the bodies of three abductees. The surgeries were successful and the three “implants” were recovered and sent off for scientific analysis. This, however, was only the beginning. Further successful surgeries followed. By 2003, Leir and his team and performed nearly a dozen surgeries. In each case, the procedures were successful and the implants were recovered. Here’s where the story gets incredibly interesting. The studies of the implants are showing remarkable features that may eventually provide conclusive proof of extraterrestrial intervention. Some of the unusual features include a similar or identical appearance of implant from patient to patient, the presence of an electromagnetic field coming from the implants, strong magnetic properties, fluorescence, a composition that is elementally similar to meteorites, a lack of inflammatory or foreign body response in surrounding human tissues and more. The complete story is told in Leir’s groundbreaking book, The Aliens and The Scalpel, though the research is still ongoing. Many California military bases have been associated with UFOs including George AFB, Hamilton, Norton, Miramar, Castle, Alameda and others. Of all of them, however, Edwards Air Force Base (formerly Muroc) tops the list. Located in the vast Mojave Desert, this area has attracted an incredible amount and variety of UFO activity starting in 1947 to the present day. In fact, the events at Edwards AFB are of such a magnitude that they may rival even the Roswell incident. While the sightings, UFO-airplane chases and landings are enough to place Edwards at the top of this list, the story doesn’t end there. At this point, things become very controversial. According to a growing number of sources, on February 20, 1954 President Eisenhower visited Edwards AFB where he and other high-ranking officials had an alleged face-to-face diplomatic meeting with extraterrestrials. Numerous researchers have looked into the story and have come back with some surprising confirmation. At this point, however, the whole truth remains obscured. Beyond that (if that isn’t enough) there are also claims crashed UFOs, reverse engineering of UFO hardware, and even actual live aliens working at the base along with humans. While these stories remain on the fringe of UFO research, the stories continue to circulate. Whatever the case, as can be seen, Edwards AFB has an undeniably very close and on-going association with UFOs. As with any list, there are other encounters/events that could just as easily have placed, including the publication of UFO Magazine by Vicki Ecker, the launching of the Black Vault website (www.blackvault.com) by John Greenwald Jr., the influential investigations of Edith Fiore Ph.D., Richard Boylan Ph.D., Jacques Vallee, James Harder Ph.D. Barbara Lamb MFCC, Yvonne Smith HT, Michael Lindemann, Ann Druffel, Bill Hamilton and many other prominent California researchers, the sightings over several California Air Force Bases, the California-based crash/retrieval cases, the November 16, 1963 San Fernando Valley Angel Hair case, the Antelope Valley sightings, the Kim Carlsberg case, the Licea Davidson case, the Jaoa Buist case, the Clint and Jane Chapin case, the Reverend Harrison Bailey case...the list goes on. Also, another investigator would probably come up with a different and equally valid list. I can only apologize and beg for mercy and the understanding that I am literally neck deep in UFO cases, making it difficult to choose the best ones. All of the above cases and many more are presented in my book in detail. Having researched so many California cases, I have come to some tentative conclusions. Although I’ve been investigating UFOs for years, I am still shocked by how many cases there are. California has approximately 5000 recorded encounters. But as every researcher knows, only about one person out of 100 reports their encounter in any official capacity. In my own experience, the number is even less. Therefore, the actual number of California encounters is at least a half million or more. My next big surprise was just how much evidence there is in support of UFOs. After more than fifty years of citizen and governmental investigations, there are literally mountains of evidence. If one takes the time to examine the evidence objectively, one will find that the proof of UFO reality is now in the public arena. Several of the above cases provide, I think, enough evidence to show that UFOs are real and are probably extraterrestrial in origin. The next tasks are educating the public, particularly the mainstream skeptical scientific community, the continuing fight against the UFO cover-up and, of course, attempting to mount better-funded on-site, real-time investigations.